On California's Redwood Highway, you might expect to the 175-mile drive between Leggett and Crescent City take you through one big, continuous forest, but redwood trees don't grow like that. They cluster in groves instead. Between those groves, you will also see some of Northern California's most dramatic scenery. You can spot elk, hike through a canyon filled with ferns, or stop to see the famous Chandelier Tree where you can actually drive your car through the trunk of the tree (it got its name from the branches). With enough time, you can also take side trips, travel through time into a village full of charming Victorian-era homes, watch the waves crash on offshore rocks, or take a photo of yourself next to an oversized statue of Paul Bunyan and his pal Babe the Blue Ox. The trees that grow along the Redwood Highway are Coastal redwoods (sequoia sempervirens). They're the tallest living things on our planet, reaching 300 to 350 feet high and 16 to 18 feet across, which actually makes them look skinny. If you're looking for the massive, thick-trunked redwoods, you need to go to the Sierra Nevada Mountains around Sequoia and Yosemite National Parks instead. The dramatic scenery along the Redwood Highway is between Crescent City on the north and Leggett on the south. Here are a few don't-miss sights along the way, organized from north to south. Howland Hill Road: Of all the things you shouldn't miss along the Redwood Highway, Jedediah Smith State Park is at the top of the list. That's where you can take the super-scenic Howland Hill Road, a 6-mile drive that is a must if you have never been in an unspoiled redwood forest. It's not suitable for all vehicles, but you can use the Jedediah Smith Park guide to find out what you need to know before you go. Crescent City: This is the home port for a commercial fishing fleet, which you can see coming and going in the bay. The things to do in Crescent City include visiting its scenic lighthouse and hunting for agate stones on a nearby beach. Prairie Creek Redwoods: During Roosevelt Elk mating season, all you have to do to see the bulls bellow and challenge each other for mating rights is pull off the road. Any time of year, you can hike through the scenic Fern Canyon with 50-foot-tall walls draped with seven kinds of ferns, or pitch your tent near the ocean at Gold Bluffs Campground. To find out how to visit it and what to know ahead of time, check the complete guide to Prairie Creek State Park. Eureka: Use this guide to plan your visit to a cute little town that's a good place for an overnight stay. Besides visiting the nearby redwood parks, you can also admire the exuberant Victorian architecture in the Old Town area, go bird-watching at the nearby marsh or take a cruise on the Humboldt Bay. Side Trip to Ferndale: The four-mile side trip off the main highway to get to Ferndale is worth the trip all by itself, crossing the Eel River and passing fields and dairy farms. It will take you to the town which stood in for Lawson in the 2001 Jim Carrey film The Majestic. It's as neat as the proverbial pin, with its streets lined with Victorian-style cottages. Scotia: Scotia is worth a quick side drive off the highway to see the last remaining "company town" in America. It's home to about 250 Pacific Lumber Company employees, some of whom have worked for the company for generations. Humboldt Redwoods: No redwood park in the State of California can beat Humboldt Redwoods State Park for the height of its trees. One-third of the park is an old-growth forest, making it the most extensive expanse of ancient redwood trees left on planet earth. The most dense and impressive groves are along Bull Creek and the Eel River, and the best stops are Founders Grove and the Women's Federation Grove. 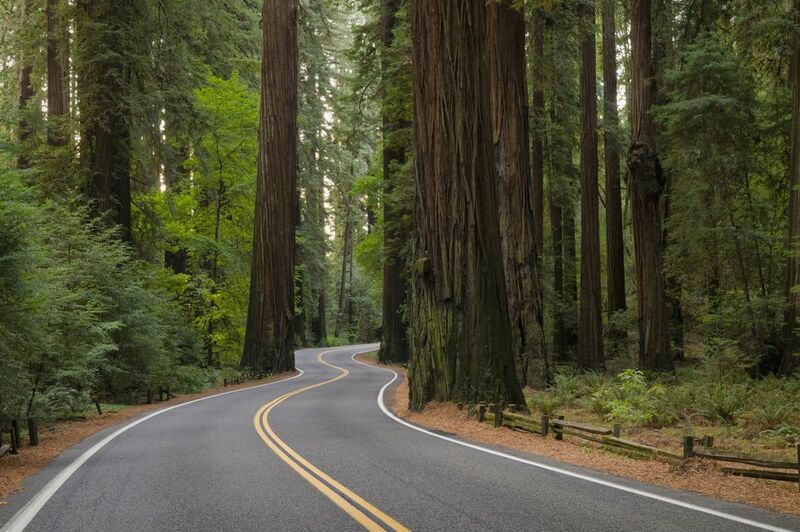 Avenue of the Giants: Within Humboldt Redwoods, the 39-mile-long Avenue of the Giants is the highlight of the visit, and one of the don't-miss things to do along the Redwood Highway. It's the only place in the world where you can drive on a paved road between soaring coastal redwood trees that can grow as tall as a 30-story building and make the park smell like Christmas all year round. If you read other guides to the Redwood Highway, you'll find lots of other redwood groves and small parks listed. Each one has its claim to fame, but most are smaller than the locations listed above and are better for a quick picnic stop than for an extended stay that would take up time better spent elsewhere. Lady Bird Grove is also frequently mentioned on the Redwood Highway. However, it is often foggy, and at 1,200 feet above sea level, it's too high to find the dramatic groves you can find at lower elevations. The Newton B. Drury Scenic Parkway at Prairie Creek Redwoods is also less remarkable compared to Avenue of the Giants or Howland Hill Road. Besides all the natural beauty on the Redwood Highway, you'll find a generous helping of roadside kitsch. These are some of the roadside attractions you'll find along the Redwood Highway, from north to south. All of these attractions are privately owned and charge admission. Larger vehicles may be too wide to actually drive through the trees. The One-Log House near Garberville is self-explanatory and doesn't take long to see. Along the road around Garberville, you'll find lots of roadside stands selling Bigfoot souvenirs. At Confusion Hill in Piercy, you can see the World Famous Gravity House, the Redwood Shoe House, and Ripley's Believe It or Not's "World's Tallest Free-standing Redwood Chainsaw Carving." The World Famous Tree House is also in Piercy. The Chandelier Drive-Through Tree is near Leggett and is one of the few places left in California where you can actually drive through the middle of standing redwood. Parts of U.S. Highway 101 between Crescent City and Leggett are two lanes with no shoulders and only occasional passing areas. You may need an ample supply of patience, especially with those drivers going 45 miles per hour who don't think the signs that say "slower traffic use turnouts" applies to them. If you're driving one of those slow vehicles, know the law. If you see five or more cars behind you, you must pull off the road as soon as you can do so safely and allow them to pass. If you're driving an RV or towing a travel trailer, you won't have any trouble as long as you stay on the main highways. You can even take them on the Avenue of the Giants scenic drive. Smaller side roads may not be accessible to you, including the drive to Fern Canyon and Gold Bluff Beach in Prairie Creek Redwoods, as well as Howland Hill Road. Depending on your cell phone carrier, you get little to no cell phone service along parts of your drive. Because that may affect your navigation app, the Redwood Highway is one of the places where it's still a good idea to go old school and take a paper map.